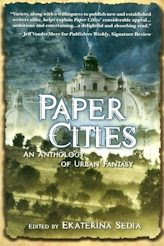 My story recommendation for this week is "Palimpsest" by Catherynne M. Valente, a short story from Paper Cities, an anthology of urban fantasy edited by Ekaterina Sedia (cover illustration by Aaron Acevedo). Four strangers sit in the red chairs, strip off their socks, plunge their feet into the ink-baths, and hold hands under an amphibian stare. This is the first act of anyone entering Palimpsest: Orlande will take your coats, sit you down, and make you family. She will fold you four together like quartos. She will draw you each a card -- look, for you it is the Broken Ship reversed, which signifies perversion, a long journey without enlightenment, gout -- and tie your hands together with red yarn. Wherever you go in Palimpsest, you are bound to these strangers who happened onto Orlande's salon just when you did, and you will go nowhere, eat no capon or dormouse, drink no oversweet port that they do not also taste, and they will visit no whore that you do not also feel beneath you, and until that ink washes from your feet -- which, given that Orlande is a creature of the marsh and no stranger to mud, will be some time -- you cannot breathe but that they breathe also. As this excerpt suggests, Valente writes remarkably rich, lush prose. (The same is no doubt true of her poetry, which I have not read.) Usually I avoid authors with such an ornate style, because I find it annoying if not done just right. Thankfully, Catherynne Valente does it just right. She immerses you in her story without letting it become oppressive. Her two-volume fantasy The Orphan's Tales was a World Fantasy Award nominee and won the Tiptree Award and Mythopoiec Award, and there is every indication Valente is just getting started. "Palimpsest" gives us a preview of Valente's forthcoming novel of the same title, scheduled for release in February 2009. I can't wait. 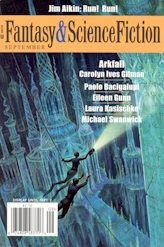 My story recommendation for this week is "Pump Six" by Paolo Bacigalupi, a novelette from the September 2008 issue of Fantasy & Science Fiction. I already praised "Pump Six" in my review of Pump Six and Other Stories, but F&SF reprinting the story gives me an excuse to talk about it again, and this story deserves all the exposure it can get. "Pump Six" is set in a near-future New York City in obvious decline. Infrastructure is falling apart, sterility is a rampant problem, and many of the children who are born turn out to be bizarre mutations. Yet New Yorkers seem absurdly unconcerned about all this. The main character is trying to keep the city's sewage plant operating, but he can't even convince his coworkers that wearing a smiley-face sticker does not protect them from the effects of polluted water. Bacigalupi eventually gives us a science fictional explanation for why people are behaving so stupidly. "Pump Six" is by far Bacigalupi's funniest story to date, but it is also just as effective a cautionary SF tale as most of his work. Paolo Bacigalupi has only published eleven stories, but they are as strong a body of work as anyone in the field has produced in the last decade. (His twelfth story, "The Gambler," to appear in the forthcoming collection Fast Forward 2 edited by Lou Anders, is also excellent.) His stories are always beautifully written and usually address issues important to our collective future. Bacigalupi has been nominated for the Hugo Award three times, and I suggest "Pump Six" merits a fourth nomination. This slipcovered limited edition was issued simultaneously with a much less expensive trade hardcover edition. The bookseller from whom I acquired the Book of the Week apparently did not realize that he had the far more valuable limited edition, perhaps because the signed limitation page is inserted at the back of this book instead of in the front. And so I got to add to my collection a book I had coveted but for which I hadn't been prepared to cough up full price. Of course, the bookseller gets the last laugh. The bread and butter of the used book trade is taking advantage of us poor suckers who hang out at bookshops hoping to find a rare first edition, but buying out the rest of the booksellers' stock while we look. 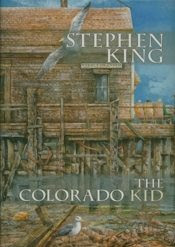 The Book of the Week is PS Publishing's limited edition of The Colorado Kid by Stephen King. This is my coolest acquisition from the dealer room of the recent World Science Fiction Convention here in Denver. It is the first hardcover edition of The Colorado Kid, preceded by the paperback original from Hard Case Crime. I also have the paperback, but this numbered (mine is copy #5), slipcovered, limited edition is much the preferred edition, in no small part because it is signed by Stephen King as well as by the artist Glenn Chadbourne and by Charles Ardai, who wrote the introduction. A slipcover is always a dead giveaway that a publisher is trying to get you to pay too much for a book. This time I was willing to do it, because my collection has been missing anything signed by Stephen King. The nice thing about a signed limited edition like this is you know the signature is authentic. Because he is so popular and because he does not do many public appearances, Stephen King is one of the few living authors whose signature is valuable enough for unscrupulous folks to bother forging. Stephen King wrote The Colorado Kid for the Hard Case Crimes set of cheap, lurid, pulp-style mysteries. Charles Ardai, one of the creators of Hard Case, wrote to Stephen King's agent asking if King would write an introduction to Hard Case's first book. Ardai's introduction to the Book of the Week describes how he nearly suffered a heart attack when the agent called to say that Stephen King would rather write one of the books himself. The novel King wrote, The Colorado Kid, is not really lurid or pulpish, but nevertheless fits nicely into the series because it is in part an extended meditation on what is appealing to us about mysteries. Incidentally, The Colorado Kid has almost nothing to do with Colorado; it all takes place on a small island off the coast of Maine. Next week's BOTW will be a slipcovered limited edition I recently acquired on the cheap. My story recommendation for this week is "Daughter of Bótù" by Eugie Foster, from the August 2008 issue of Realms of Fantasy (story illustration by Jada Fitch). "Daughter of Bótù" is a fairy tale with an Eastern flavor. It is the tale of An-ying, a rabbit transformed into a young woman, who quickly falls in love with a prince. The premise may sound routine but it soon turns into something memorable, thanks to Eugie Foster's gorgeous prose and to the twists the story takes as the love between An-ying and her prince becomes rather complicated. In the past five years, Eugie Foster has published an impressive volume of interesting short fiction, commonly with an Asian setting and feel. 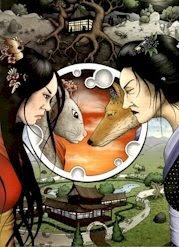 Her collection Returning My Sister's Face and Other Far Eastern Tales of Whimsy and Malice is due out early in 2009 and is one to watch for. The August 2008 issue of Realms of Fantasy has an impressive list of contributors, including Liz Williams, James Van Pelt, Carrie Vaughn, and Jim C. Hines, but even among such strong company, I found "Daughter of Bótù" the clear standout. 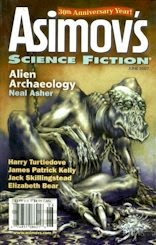 The Magazine of the Week is the June 2007 issue of Asimov's Science Fiction, with funky alien cover art by John Allemand. This is the Magazine of the Week because it contains "Tideline" by Elizabeth Bear, this year's Hugo Award winner for Best Short Story. Elizabeth Bear has recently burst onto the science fiction and fantasy scene. Her first story was published in 2003 and her first novel in 2005, but incredibly she will have released fourteen books by the end of this year, all of which have been well received. "Tideline," her first work to be nominated for a Hugo Award but one suspects not the last, is the moving tale of a derelict but intelligent war machine seeking meaning in its final days of consciousness before its batteries die. Having now covered all of Denvention's Hugo winners for fiction, next week's Book of the Week will be the most collectible item I acquired in the Denvention dealer room. My story recommendation for this week is "Hungry: Some Ghost Stories" by Samantha Henderson, from the April 2008 issue of Lone Star Stories. "They gather in the kitchen sometimes," it begins. "Hungry: Some Ghost Stories" is an elegantly constructed series of short vignettes and one-line questions about ghosts and about the stories we tell ourselves and the memories that haunt us. It will only take you a few minutes to read, but I suspect will stay with you much longer. Samantha Henderson has been generating quite a bit of buzz with her short fiction, and her first novel Heaven's Bones is just out. 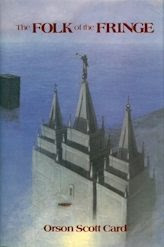 "Hungry: Some Ghost Stories" is a good example of Henderson's distinctive style and flair. Lone Star Stories has been publishing high-quality short fiction free on-line since 2004, but I am not sure it is finding all the readers it deserves. I fear that "Hungry: Some Ghost Stories" is especially likely to be overlooked because Lone Star Stories editor Eric T. Marin has for some reason labeled the piece as poetry. Apparently he deemed it a "prose poem," a term that strikes me as a non sequitur. I certainly enjoyed it even though I generally don't grok poetry. Whatever you call it, "Hungry: Some Ghost Stories" is well worth checking out.